TODAY'S new entertainment reporter Brooke Boney has waded in to the Australia Day debate during her first week on air, delivering an impassioned argument for changing the date this morning. The journalist and proud Gamilaroi Gomeroi woman, new to Today as part of a major shake-up for the troubled Channel 9 breakfast show, was present on the panel as talk turned to this month's Australia Day public holiday - and the ongoing discussion about changing the date out of respect for indigenous Australians. 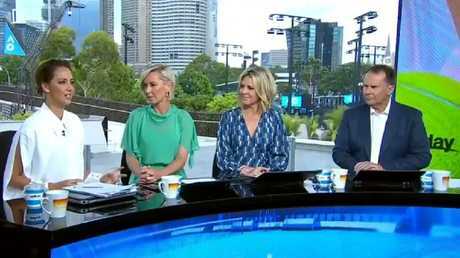 Debate had been reignited after tennis legend Pat Cash said he is embarrassed by the way Indigenous Australians are treated and is calling for the date of Australia Day to be changed. "I'm part of that community. I'm a Gamilaroi woman, my family's from northern NSW, been there for about 60,000 years or so," said Boney, who often uses the Gamilaroi greeting "Yaama" when introducing herself on air. "This date comes up every year. I'm not trying to tell anyone else what they should do or how they should be celebrating, but I feel like I have more reason than anyone to love this country as much as I do. "I'm the oldest of six kids, (with a) single mum. I get to sit on the Today show to talk to you guys about this. I get to travel around the world with the Prime Minister and ask him questions about issues. This is the best country in the world, no doubt. 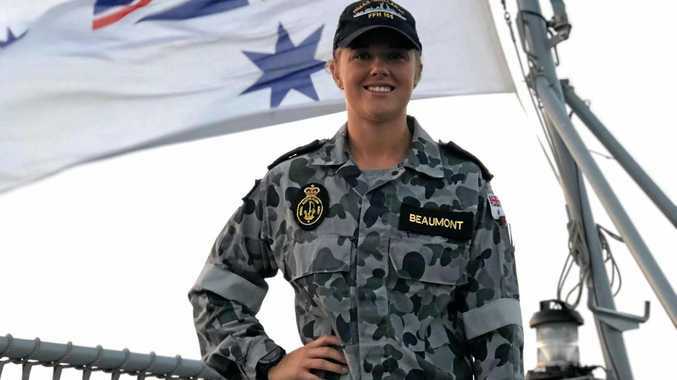 New recruit Brooke Boney speaks up on the Today show. "But I can't separate 26 January from the fact that my brothers are more likely to go to jail than school, or that my little sisters and my mum are more likely to be beaten or raped than anyone else's sisters or mum. And that started from that day. "Because that's the first day; that's the day that it changed for us. That's sort of the beginning of what some people would say is 'the end'. That's the turning point," he said. Pressed by host Deb Knight for her own solution, Boney suggested instead celebrating the anniversary of Australia's Federation, January 1, 1901. "Chuck on another public holiday at the end or just celebrate it on another day, but I think a day that suits more people is probably going to be more uniting," Boney said. Jones said he was "upset" at the "us versus them" mentality that he felt permeated the debate - which prompted a swift response from Gardner. The new Today show panel. "Can I jump in? Isn't that because of precisely what we have seen. We have seen people living in a community in a way that we don't see white Australians living and it is just appalling to see a community in a civilised country like Australia without electricity and running water. This is third world conditions. It is horrific," she told him. "I don't doubt that whatsoever. I'm sorry, but we do see white Australians in similar situations. We see kids going to school without lunch, without a school uniform," Jones said. "But the statistics tell us that our lives are harder," Boney said. "That is not me making it up, saying woe is me or feel sorry for me because I don't want anyone to feel sorry to me. What I'm talking to is the statistics. That's what I said to you about my brothers being more likely to go to jail. Our lives being harder." "It shouldn't be an us versus them thing," Jones said. "Well, I wish it wasn't," Boney said. As they wrapped the segment, hosts Gardner and Deb Knight thanked Boney for her insight - and her response suggested viewers could expect to hear more from her on these issues. "Absolutely. I'm more than happy to talk about this stuff. I love it!" she said. Later in the show, the hosts read out feedback from viewers on the issue - and reactions were mixed. "I have spoken with many Elders and lived in central Australia for many years. We cannot change the past but for true reconciliation to occur we need to move forward together. Australia Day is a day of coming together and celebrating our amazing country. Changing the day won't change anything. Let's move forward together and celebrate our country on the 26th Jan," wrote one viewer on the Today Facebook page. "How will changing the date help her brothers and sisters?" asked another. "Changing the date isn't about changing current circumstances for Indigenous people, it's about acknowledging that that was the day Australia was invaded and massacres began of the native people of this land and forever changed their way of life. It's like we are celebrating the mass killings of their people. Any other day everyone can celebrate and come together as a unified nation," wrote another.